Cute little Heart swirl handmade origami earrings with Swarovski pendant, Each piece are made from Washi paper and polished with strong water resistant lacquer gives a long lasting glow perfect gift to bring a smile on your love one's face. Patterns may be slightly different from photo. Love heart swirl handmade origami earrings with sterling silver hooks. Each piece are made from Washi paper and polished with strong water resistant lacquer gives a long lasting glow perfect gift to bring a smile on your love one's face. Patterns may be slightly different from photo. Love heart handmade origami earrings with 2 Swarovski Pendants and sterling silver hooks. Each piece are made from Washi paper and polished with strong water resistant lacquer gives a long lasting glow perfect gift to bring a smile on your love one's face. Patterns may be slightly different from photo. Stunning Love heart origami earrings. Each piece are made from Washi paper and polished with strong water resistant lacquer gives a long lasting glow. 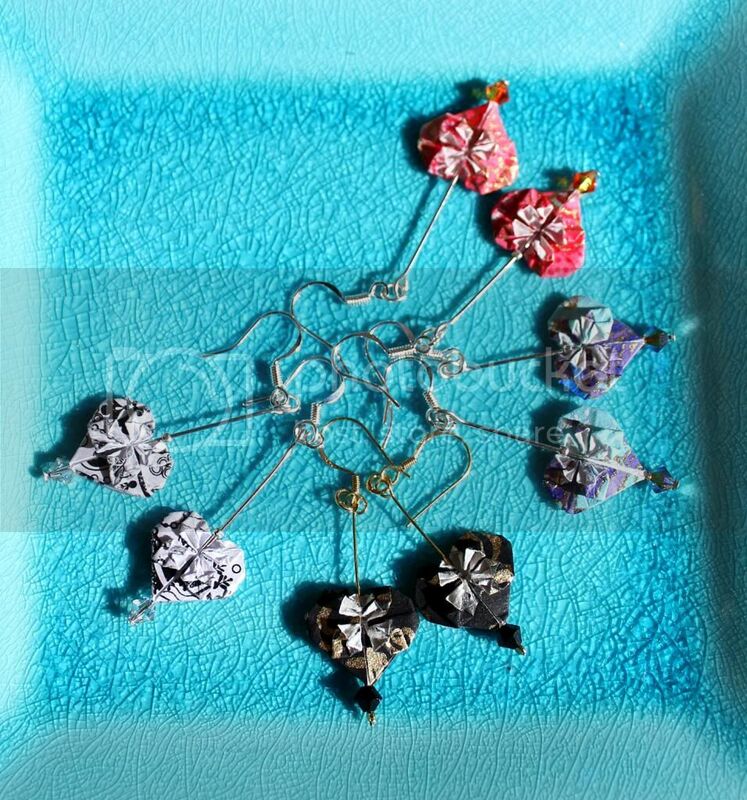 Each love heart are attached with Swarovski Crystal pendant and sterling silver hooks. Every Patterns may be slightly different from photo.